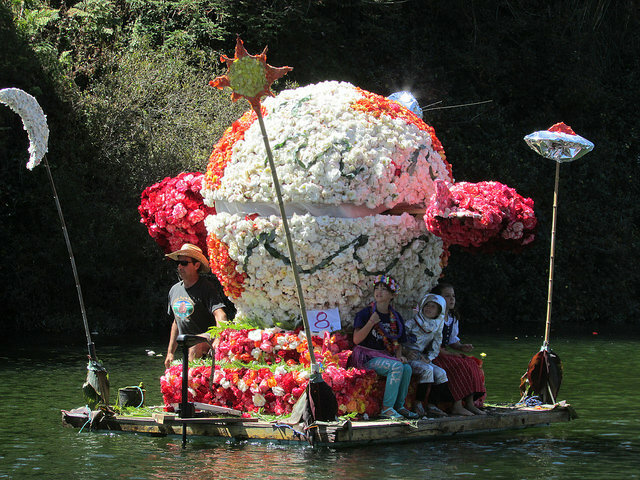 Case Finkel’s previous float: “Inter-Galactic Begonia Explorer”. Grand Prize Winner, 2016. It has brought together families, friends, organizations and people from near and far for designing, building, decorating, and cheering on the colorful floats that travel Soquel Creek. Local Santa Cruz went behind the scenes for interviews with several of the eleven teams constructing floats for the 65th and final parade. Case Finkel’s team members have been a part of the parade for many years. 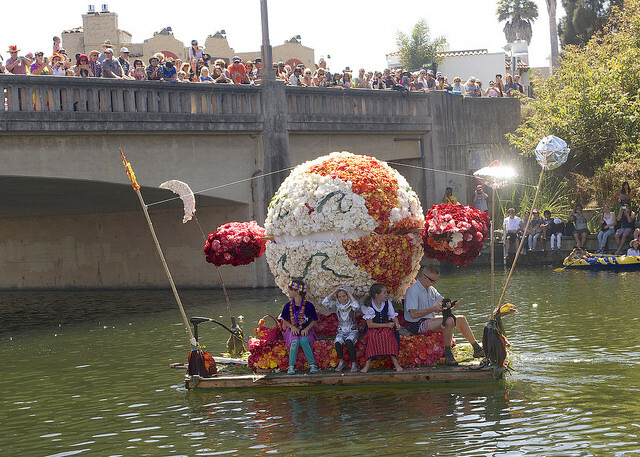 In 2016, Team Casa Finkel was honored as Grand Prize Winner and Best Showmanship for their begonia float, “Inter-Galactic Begonia Explorer Mission”. This week, they’ve been busy preparing their 2017 float, “Miss BUGonia ‘Th, Th, Th, That’s All Folks’”. Casa Finkel represents the Festival’s outstanding historical value, community spirit, and creative collaboration. Read on for an interview with one of the team leaders, Dan Finkel, who shares about the team, their 2017 float, and what has made the Begonia Festival an unforgettable experience for everyone involved. Local Santa Cruz: What is your connection to the Capitola Begonia Festival – how have you participated in the past? Casa Finkel: The short answer would be: Since 1999, William Miller, Don Mac, and a revolving group of us, have designed, created, and put together 15 floats. Over the years, quite a few floats were built in our yard along the creek. Before that, if I remember correctly, I crawled in the ‘diaper derby’ at age 1 1/2 and later, I grew up participating in fishing derby’s and row boat races. 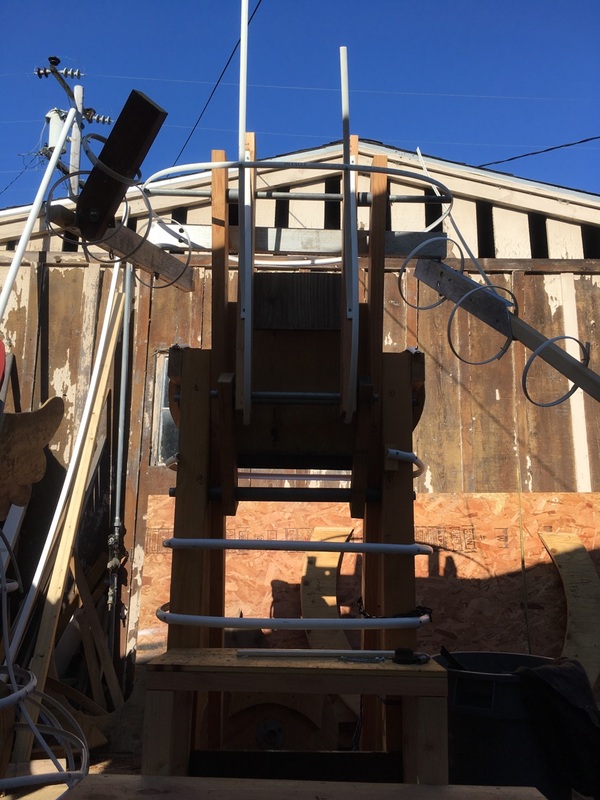 We built our float this year, traditionally, with a wooden (4×4, 2×4, plywood) structural base. There is a primary mechanism for movement. To support the weight of all the flowers, we use stand-offs and various sizes of PVC, for creating forms and contours. We have about 400 boxes of flowers to pick and fill on Saturday and as always, requires no less than a miracle, to finish by Sunday. We try to choreograph music with our narrative and float movement, in hopes to create an “un-easy moment”, usually while maneuvering under the bridge. With the 65th Festival’s theme being “Begonias Take A Bow”, we decided a Looney Tunes theme of, ‘That’s All Folk’s’ was fitting. We are inspired by “What’s Opera Doc?” from a Buggs Bunny episode. 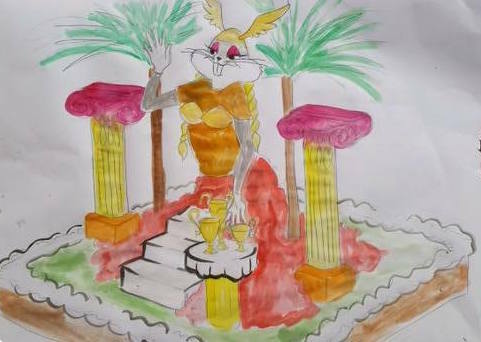 The name of our float figurine is Ms. Buggs-gonia. Also, we are also inspired that this will be, seriously, the last begonia nautical parade, as well. We intend to have some fun. What is most enjoyable/challenging about the creative process? The most challenging aspect is having only 24 hours to individually pick, poke with floral wire, and secure roughly 10,000 blossoms (or decorate) to the float. In addition, there are seemingly 10,000 decisions, zip-ties and staples that need to be secured, by the time it is all said and done. Oh, and the clean-up process is challenging as well. As we travel through this process one last time, as always, the most enjoyable aspect is the collaboration amongst friends and families when we get together. Some of the people we see often, but don’t talk very much. Some, we seldom see, maybe only once a year during the Begonia Festival. Either way, for our dedicated group, it has become a rewarding experience to stay in touch with each other. We have watched all the little ones grow older, we count grey hairs, bounce ideas around, and have some fun. Knowing that a camaraderie becomes formed while we strive to attain a mutual goal. That we are creating something artful and beautiful, while creating fond memories. Some good senses of humor along the way helps with having some fun. And this year’s pot-luck style, themed ‘The Last Meal’ afterward will be a favorite among us. Growing up through the 70’s and 80’s, the Capitola Begonia Festival took place the first weekend after Labor Day. It signified the end of the Summer Season, when the crowds of people and traffic thin out. A sense of joy would fill the air. 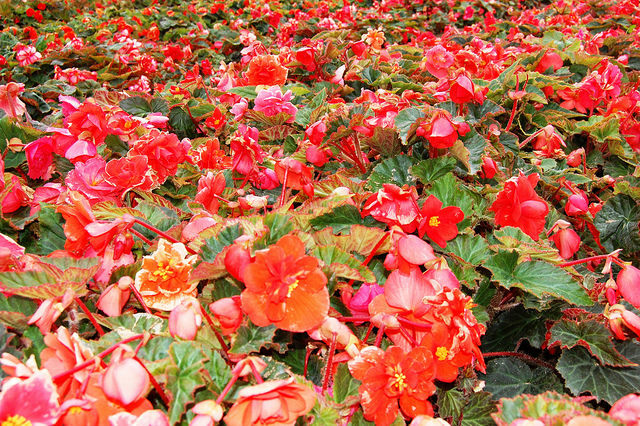 The begonia fields were grandiose. There were always 20 plus, begonia cladded floats and, folks decorated the businesses and the homes with the colorful blossoms. There were parties in almost every yard and on most porches all over the village. 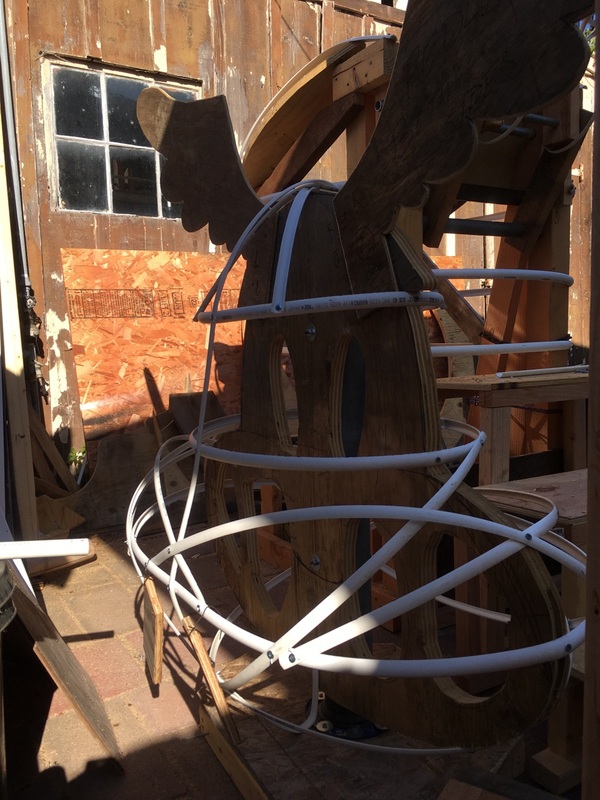 Creating floats has been a way of connecting the past, with the present, and keeping the spirit of our predecessors alive. As the fields have been diminishing, this last parade seems to symbolize ‘A letting go of that piece’ of Capitola’s history. To be a part on this stage of history, that is disappearing, means a lot to me. Case Finkel’s 2016 float traveling under Stockton Bridge.